Sein Ta Lone mango gift boxes go on display at the Sule Shangri-La last friday. Mangoes are among the most popular fruits in the world and Myanmar is blessed with a wide range of the tropical delicacy. Mangoes are currently in season in Myanmar and the Sule Shangri-La is celebrating with an overload of mango goodness throughout its restaurants and bars. The hotel’s two-month long Mango Festival will tempt guests with the sweet and rich taste of mangoes in a number of delicious and different forms. There are over 400 varieties of mangoes in the world and Myanmar is said to have more than 100 types that come in a wide range of tastes, colors and shapes. But for the Sule Shangri-La there is one variety that is king of them all: the Sein Ta Lone. Cakes made from Sein Ta Lone mongoes are available at the hotel’s Peacock Lounge. “Our chef is using the Sein Ta Lone (variety) and we collect them from the best local mango suppliers,” said Ms. Mildred Amon, director of communications at the Sule Shangri-La. She added that many people regard the Sein Ta Lone as the best mango in the world because of its delightful smell, sweetness, juiciness and non-fibrous flesh. The Sule Shangri-La prepares Sein Ta Lone mangoes in a number of ways so they can be consumed as part of a meal, a snack or even as a drink at its Gourmet Shop, Peacock Lounge, Gallery Bar or Summer Palace. The hotel is also preparing mango gift boxes, with each box containing six high-quality Sein Ta Lone mangoes that will make the perfect gift for someone or that simply can be enjoyed at home. The gift boxes are available at the hotel’s Gourmet Shop. The shop also offers a wide selection of other mango-based goodies, such as homemade mango yoghurt, mango bread, mango tarts and cupcakes. The star of the show, however, might be a special Sein Ta Lone cheesecake, which costs USD$28 per kilogram. For afternoon high-tea lovers, the Shangri-La is laying on a mango-inspired high tea set at the Peacock Lounge for only USD$15. The Lounge also offers a mango juice, mango icy shake, mango mocktails, mango margarita and other seasonal temptations. My all-time favorite seasonal mango juice is fluid, thick and fragrant of the Sein Ta Lone. It’s so good; just one sip of the juice is instantly refreshing — not too sweet and not too sour. The hotel is also offering a mango salad with dried shrimp Thai sauce (US$8), deep-fried rice paper roll with beef and mango (US$12) and many other foods infused with mango at the Shangri-La’s Summer Palace Restaurant. 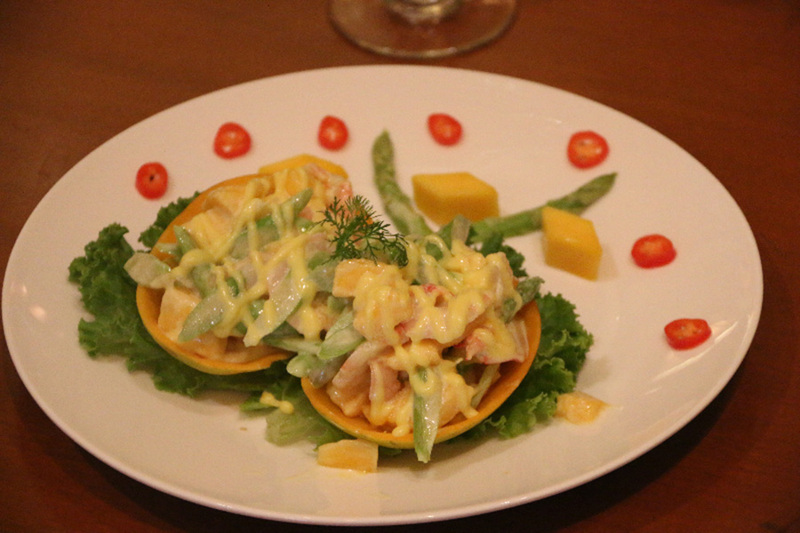 Among the range of Sein Ta Lone, the hotels is offering only Ma Chit Su (a kind of mango) with chilli powder. This spicy mango dessert is usually sold by street vendors and foreigners don’t dare try it but the Sule Shangri-La will be offering the item for US$3. The Mango Festival lasts for only two months and will end in June. So, if you are mango lover, don’t miss this chance to taste these different foods made of mangoes.